At the end of my junior year, I was beginning to worry that I hadn’t been exposed to enough different kinds of research. I wanted to try absolutely everything before the end of my undergraduate career, and since “everything” is rather a lot to cram into four years, it seemed to me as though I had to get cracking. At first I wasn’t sure where to start. There are summer programs and research openings for undergraduates in just about every imaginable discipline and geographical location, and it took some serious sorting through before I could begin to figure out what I might want to try. In the end, I decided to look for a research-based job involving conservation and field work. (Because I felt that my goals were somewhat lacking in specificity, I also added “increased geographical proximity to tropical fruit” to this list. Sadly, this last bit was not to be.) Feeling purposeful but vague, I poked around a bit more to see what I could make of my summer. I essentially stumbled into a position as the conservation genetics intern with Kwiáht, a small conservation nonprofit dedicated to preserving the ecological integrity of the San Juan Islands and the Salish Sea. It was brilliant. 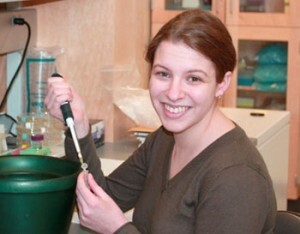 My primary project involved determining the population structure of the islands’ populations of cutthroat trout, which allowed me to expand my interest in genetics from the microbial level to the ecosystem scale. My work in the lab was regularly punctuated with forays out into the field, helping other people on the team with their projects and collecting more data for the genetics projects. I spent entire days seining at various beaches on the islands, collecting samples of native plant species, and taking surveys of tiny porcelain crabs. It was very nearly a dream job. The islands are located between coastal northwest Washington and Vancouver – hence, no pineapple plantations or palm trees – but they’re staggeringly beautiful in a guava-less kind of way. Since Kwiáht rents their lab space from Friday Harbor Laboratories on San Juan Island, the professional environment is every bit as impressive as the natural ambiance. Becoming an islander was quite an experience. It only took a few days for me to discover the various challenges involved with commuting (dictated by the ferry schedule), bicycling (uphill, always), and locals (who will insist on saying hello to you, asking you where you’re living, and offering to show you their vegetable garden sometime, whether or not you happen to be late for your ferry). Almost as soon as I discovered these island eccentricities, however, I found them charming. Rush hour commuting through downtown Worcester has absolutely nothing on cruising to work on a ferry while listening to tourists arguing about which island it is that they’re passing. What really tied the whole thing together was a nifty little grant available through Clark’s career services. The Barth Summer Internship Awards provide stipends to students doing unpaid internships at nonprofit organizations. One of the things I immediately liked about Kwiáht was that every last dime is stretched about as far as it can go, so that all of the various projects can continue even when sources of funding dry up. Because there was a way to secure independent funding through Clark, I could get myself to the west coast and back without worrying that I was depleting Kwiáht’s financial resources for underfunded (but important!) projects. I was even able to contribute some new reagents and lab materials to the effort. In short, my summer with Kwiáht was everything I had hoped it might be: instructional, unique, and enormously fun. For any aspiring science student, there’s nothing quite as useful as actually experiencing hands-on, fulltime research. (Wouldn’t you rather know what you’re getting yourself into?) Going into my San Juan summer, I figured that even if I hated my job, I’d at least learn something about what I didn’t want to do. Coming out of it, my only regret is that I can’t go back and do the same thing all over again.